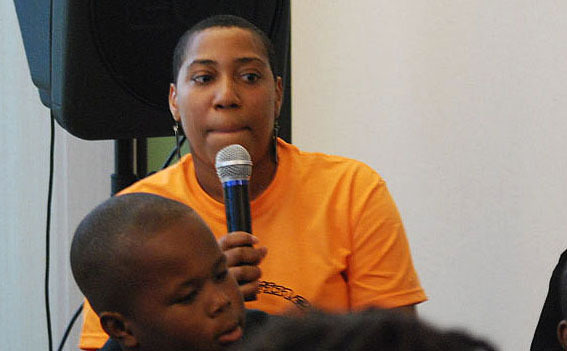 Frustrated with the lack of programs and outlets for youth in Englewood, lifelong neighborhood resident Asiaha Butler started working to change the impression of her neighborhood with a program that gives young people an opportunity to express themselves with words rather than gunfire. “I’m not an anti-violence activist. I’m a peace activist,” Butler said. The monthly gathering of people between the ages of 12-20, provides an opportunity to have “a fun, safe and educational space, in the heart of a place that people call so violent,” Butler said. residents talk about what they're doing in their community. Butler acknowledged that Englewood has its problems, but feels that the media portrayal of Englewood lacks balance. The media picture of the community “is horrible. We’re the worst on Earth, we’re considered the most dangerous community in Chicago,” she said. Butler brought various groups together to organize the Oct. 30 “Spooktacular Halloween Bash” which drew around seventy locals to the 7th District Police Station, to participate in Docs and Dialogue and the Halloween party afterward. “We’re a society that feeds off of violence and negativity. Everywhere you turn it’s violence and fighting. The five o’clock top story is violence, not a whole class of youth graduated from Urban Prep,” Orange said. Butler said she couldn’t have organized the event without the support of the local police district, who donated most of the refreshments and their station house, opened by Mayor Daley in March 2009, for the event. District 7 officers worked closely with Butler to bring the event together. They run a youth sub-committee geared toward achieving similar goals to Butler. Carothers wants to see the neighborhood’s silent majority to become vocal. “The reason that Englewood is not like Mt. Greenwood, or Beverley, or Chatham is because the people that live here have not decided to make it that yet,” he said. Carothers pointed to social problems, but said poverty alone could not take the blame for Englewood’s problems, both real and perceived. Referring to a map of the neighborhood on his wall he pointed out that while Englewood is only a little more than seven square miles, it has over 60 liquor stores, who sell and market 40s and fifths of liquor. A type of marketing that attracts people who don’t buy and go, but who simply hang out in front of the store drinking the products from brown paper bags. All of Chicago’s 25 Police District Commanders have BlackBerrys, which instant message them whenever there’s a murder in the city. Carothers said every commander instinctively looks to see if it’s in their district. According to the City of Chicago’s Index Crime Summary, District 7 had 30 murders between January and September this year, which is a 3.2 percent reduction from the same period in 2009. District 7 has the third highest murder rate out of all 25 Districts in Chicago. District 6, an area just to the southeast of Englewood, reported 36 murders and District 11, which covers the West Side from Roosevelt to Division Streets, had 41 murders over the same period. Butler, Orange and Carothers all said that the perception of Englewood is worse than the reality. John McCarron, a former Chicago Tribune editorial board member and urban affairs specialist, said that although Englewood remains “an island of poverty” and may be “the national poster child for how not to do urban renewal,” the areas prospects may be improving. He listed numerous factors that were complicit in impeding the development of the neighborhood over the last forty years but referenced the new Kennedy-King City College, Urban Prep and affordable housing development St. Bernard’s Place as the signs of hope for the community’s future. Feedback: Contact the reporters via Twitter, leave a comment below and Like/Dislike this story. You also can submit a story idea or report an error.